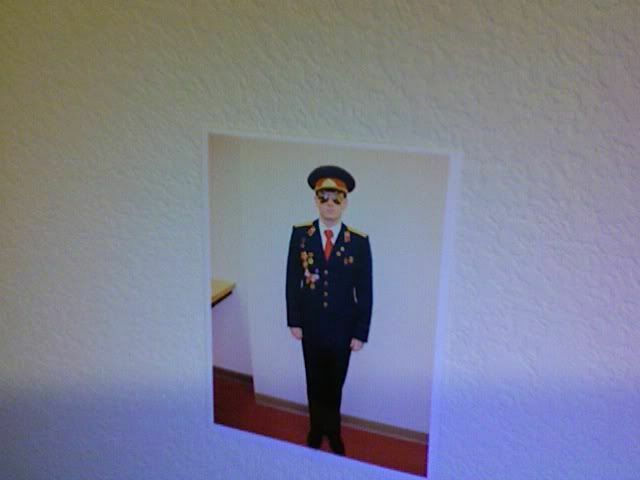 A picture of a photograph of my Soviet Uniform - Soviet-Empire.com U.S.S.R. Yes i know..a picture of a picture..
My former place of work would let us wear costumes on Halloween so I put my uniform to some use, after Halloween was long over, I snatched the picture off the billboard in our associate breakroom and kept it! Got it posted on my wall in the bedroom. I can take actual photos of the costume and medals up close as well. I have Order of Stalin, Hero of Socialist Labor, and Lenin's 100th birthday and a few more! Also some DDR medals, very few though, and a East German border guard coat and ushanka! I'd be afraid to put the Order of Stalin or Hero of Socialist Labor on my chest if i didn't deserve them. Hmmm, yes. I have thought about this, but I have no fear in wearing the medals! They're no longer active so now impossible to earn...unfortunately. The Order of Stalin is a recreation because I believe that is a very rare medal, was taken out during de-stalinization, and then the Hero of socialist labor medal I have is only a gold coating..so I may be permitted to wear them due to not being authentic. Think so? Inauthentic medals are fine. Some of the extremely common ones are okay too. Just know that in many cases in the past real medals were stolen or swindled from veterans, hence Loz' apprehension. I've heard of cases of people coming to veterans apartments to steal their medals, or even stealing them in the streets. The WW2 veterans today who are left are afraid to walk the streets on holidays with their medals, and some have resorted to hiding them in plastic bags until they reach the central squares of the streets. Quite a disgusting phenomenon, and a sign of the degeneration of Russian society. Nice picture anyway -you probably had the most unique costume at the event. Wow so the old veterans (who should be receiving the utmost respect) have to resort to such drastic measures??? That's really pathetic. That's what capitalism has done to Russia. Do they steal them because there is a big market for Soviet era medals? Heh..once again, capitalism...sheesh. Yeah I got a lot of heads to turn and a lot of Russian people (There's a lot over in CA) really liked my uniform but you wouldn't believe how many Americans mistook it for an SS uniform or a Nazi..again...sheesh. Of course I educated them, not sure how much they took in but, I tried. A few years ago an old GPW Veteran froze to death in his home in the Far East because the oligarch-owned company shut off his heating since he couldn't pay for it anymore. They had to detach his frozen body from the floor with crowbars. At it's worst, then again, not at it's worst, which is far more terrifying. And the guy who basically controls the Far-Eastern Chukotka region (Abramovich) buys football clubs in England and drives around the world in monstrously huge yachts. But at the same time he cuts of the gas to poor WW2 veterans! Last edited by Loz on 27 Jul 2011, 16:33, edited 1 time in total. Excellent picture! Just a minor thing -- I'm not too sure if the medals are worn properly, I don't mean "you don't deserve to wear them", I mean purely physical location on the jacket, I know there are certain (quite stiff) requirements as to on which side and on which height you should put each of them, at least the most significant ones. I never had any medals awarded to me so I don't know the wearing requirements in detail, but if you want to add authenticity to your excellent costume, you might want to research further. Again, I'm not criticising you at all, just a helpful hint. YES I always did wonder where the medals would go...I always figured the Hero of Socialist Labor goes at the top, and I've always seen it there on pictures of others (even Stalin) Then I also see the 100th birthday of Lenin medal near the top too. Some former soviet citizens admired my outfit as well, and one guy was in the Soviet army before and he didn't say anything about the way they were placed. But yes I did always wonder if I was doing it right..
Usually medals are worn on the left side of your jacket. Just the same as in these photos you're showing. The same kind of medals, or similar kind, that I have pinned on my jacket, on the left side, are also pinned on these soldiers' left sides. Then some are also pinned on the right side. Sorry for double post but I just realized something, the reason why I was so taken aback as to why you would say I had them on the wrong side was because that picture is taken in reverse, I took it with my laptop. I actually do have them pinned on the left side. I just now realized the picture is a flop.